Babblings of a Mommy: VS After Christmas Beauty Haul & Review. VS After Christmas Beauty Haul & Review. Last weekend my MIL and I got together for a little retail therapy session and hit up a couple of stores, including Victoria's Secret to take advantage of their after Christmas sale. I didn't intend on buying anything since I'm pretty stocked when it comes to body lotions, but who am I kidding - I can't pass up a good sale! 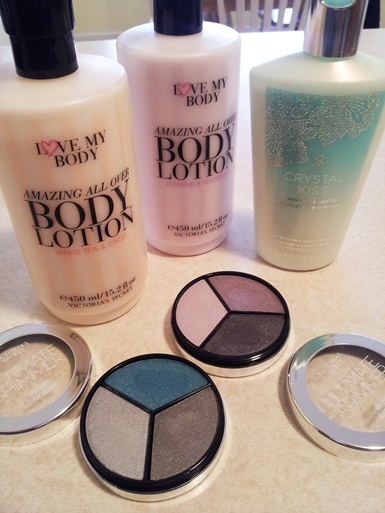 Although I wasn't planning on getting anything, I'm really glad I found the (2) Love My Body lotions. They're fresh and light and designed to not compete with your perfume. It's perfect for daily use. The Crystal Kiss is nice but nothing truly special, but hey at 3 for $15 you can't beat it! I also got the trios which I'm really happy with. They have good pigmentation and long-lasting when properly worn with a primer - at $2 a pop, you can't ask for anything more. Have you taken advantage of any after Christmas beauty sales? Do Share! Good deals you've got there! I've hit up Bath and Body Works several times for their Yellow sale. I was wondering how their shadows are because they have good combinations. I am just afraid to try them since I have sensitive skin.